There are some who see Cinco de Mayo as somewhat of a joke because they feel their culture is being exploited by U.S. beer and alcohol companies. I see it a bit differently and let me explain why. You see, I grew up in Pico Rivera, Calif., a mostly working, middle-class, Mexican-American community that commemorated the holiday with parades down the main boulevard in the center of town. Every elementary, middle and high school in the district would host big Cinco de Mayo fiestas bringing together local families. During the day, the students learned the history of Cinco de Mayo and began the preparations for the big pachanga weeks ahead of time. I can still see my mom painting the signs for all of the booths and working on the paper flowers that were strung overhead the black top between classrooms. On the evening of the fiesta, you would hear mariachi music playing, and I would be filled with nervous anticipation of joining my fellow ballet folklorico dancers. But, what I remember the most after our performance on stage is the food prepared by all of our mothers. I would walk from food booth to food booth sampling tacos, taquitos, enchiladas, churros, raspados, burritos, and other dishes I had grown up eating in my own mother’s kitchen. As an adult, I still love to celebrate Cinco de Mayo, inviting family and friends over for micheladas, margaritas, and authentic Mexican cuisine. We do so fully knowing a few things. We know the difference between May 5th and Sept. 16th (Mexican Independence Day). We know that Cinco de Mayo commemorates the 1862 military victory by a mostly Mexican Indian troop over the invading French army. We know that the holiday is not really celebrated in Mexico except for the state of Puebla where the battle took place. We also know it’s a moment in time to rekindle the spirit that my parents had during the Chicano Movement of the 1970s when they embraced the holiday for its David vs. Goliath storyline as motivation for civil rights struggles in California. We’d love to hear your Cinco de Mayo memories. This year, sit back, listen to some Chente, invite family and friends over and prepare your own Mexican fiesta. Oh, and leave your political “MECHA” sentiments at the door and imbibe in some beer and margaritas. 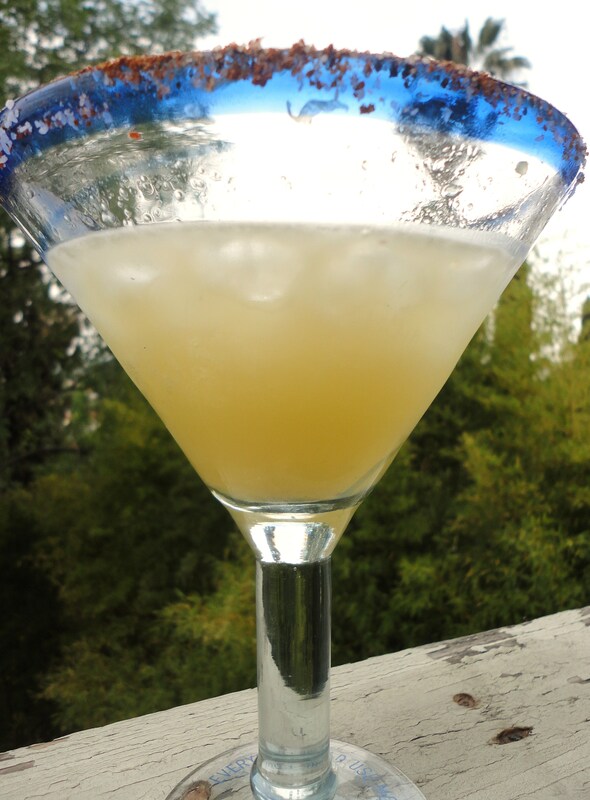 Try this delicious and simple margarita recipe made with agave syrup. So easy and really yummy. You won’t believe it. 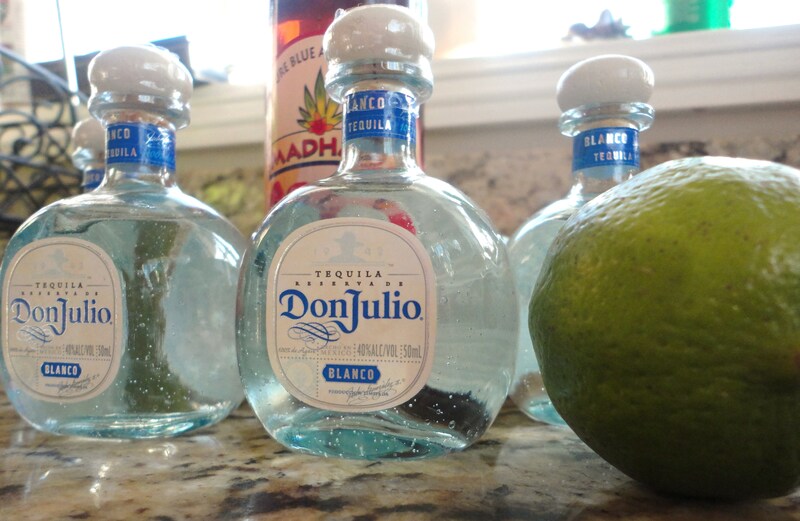 Don Julio provided LatinoFoodie with these cute little bottles of tequila blanco. This recipe is so simple and easy to make. In a cocktail shaker, add the tequila, lime juice and agave syrup and ice. Shake well. Rim margarita glass with salt. Pour ingredients and enjoy! Repeat as needed for a good pachanga.